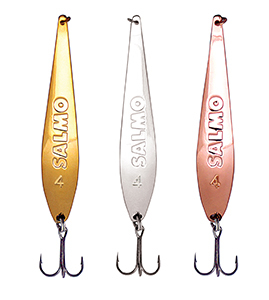 A big spoonbait designed for fishing at great depth and in rivers with streams. The fishing objects: perch, Pikes, Pike-Perches. he bait’s form allows it to glide well and to attract fish within the sight. A narrow form of the body makes this bait a universal spoonbait for fishing both a Pike and a Pike-Perch.